Linksys EA7300 MAX-STREAM™ AC1750 MU-MIMO Gigabit WiFi Router is rated 4.2 out of 5 by 151. *Fastest AC1750 router claim is based on October 2016 Tolly report, which finds that the EA7300 delivers up to 4.4x greater single client average throughput in long distance tests than top selling competing AC1750 routers. Experience powerful WiFi coverage throughout a small-size house. The Linksys MAX-STREAM™ AC1750 WiFi Router features Next-Gen AC WiFi with MU-MIMO technology, the latest advancement towards uninterrupted, simultaneous WiFi connections. Devices such as 4K TVs, HD streaming media players, tablets, game consoles, and many more use a lot of bandwidth, and with MU-MIMO (Multi-User, Multiple-Input, Multiple-Output) technology, the MAX-STREAM™ AC1750 wireless router sends WiFi to multiple devices at the same time and same speed. Your whole family can play, stream, and work at once, without experiencing lag or buffering--at up to 2x the speed of a non-MU-MIMO router. The MAX-STREAM™ AC1750 MU-MIMO Router (EA7300) was tested for performance against other AC1750 routers by the Tolly Group. The EA7300 router was found to be 4.4x faster than leading AC1750 routers, making it the fastest AC1750 router. When paired with a Linksys MAX-STREAM™ WiFi range extender such as the RE7000, the MAX-STREAM™ AC1750 WiFi Router creates a strong, seamless WiFi signal that extends throughout your entire household. Traditional routers force you to manually connect to either the range extender's or router's network in order to experience the best WiFi signal. Seamless Roaming simplifies this by enabling your device to automatically switch to the strongest signal as you move around your home, with less buffering and fewer dropped calls. Our MAX-STREAM™ AC1750 WiFi Router offers two dedicated WiFi bands that deliver combined speeds of up to 1.7 Gbps. Moreover, it can connect up to 10+ devices. High-bandwidth activities like 4K video streaming are connected to the high-speed 5 GHz band, while basic activities like email are placed on the 2.4 GHz band. Powered by a dual-core processor, the MAX-STREAM™ AC1750 WiFi Router is capable of handling multiple simultaneous data streams, which results in improved WiFi performance and faster WiFi speeds to more devices. Optimized for coverage in small homes, the three high-performance antennas broadcast a strong WiFi signal that improves connectivity in hard-to-reach areas. Play video games, listen to music, check emails, shop online, stream HD movies, and more, without having to worry about dropped signals. Connect more devices and share files at speeds 10x faster than Fast Ethernet with four Gigabit Ethernet ports. Connect a storage device to the USB 3.0 port and quickly transfer files with other WiFi devices. Rated 5 out of 5 by DrPakarr from A Proper Device to Keep the Network Up-to-date Stats - Takes about 1:20 seconds from boot to usable Wi-Fi - No speed degradation at 30ft with 5GHz, with metal-studed wall in between Pros - 3 adjustable antennas - Speedy hardware, easy-to-use software to control your network. - Ability to prioritize up to 3 devices. - Works well with Linksys Smart Wi-Fi App - Very light to handle - Powerful wireless technology - Easy to setup, just plug-in to modem & power, wait for boot to be ready, then personalize your settings Cons - Size is larger than common routers/modems, questionable since it is light given the size. Comments - A proper device for updating your wireless network. Rated 5 out of 5 by clickman from You need this!!!! This product has solved all the problems I was having with my previous router. I have a basement office laptop that is some distance from the router. The signal must pass through two concrete foundation walls and some earth before it gets there. My cable modem produces about 60 Mbps and I was only getting 6-8 Mbps at my office location with frequently dropped signal. It was frustrating. This new router produces 4-5 bars of signal strength and a download speed of around 12 Mbps consistently to my laptop. Happy dance!!! Setup was a breeze and I like that there isn't an array of bright flashing lights across the front. A thoughtfully designed and well made product. Rated 5 out of 5 by James from Great features The only problem I have with the EA7300 is the set up. I was not able to set it up myself and had to call customer service. I got to the last step and was not able to go any further. I was informed that I was following the right steps but it wasn't going to work. Abby(who was very courteous, knowledgeable and patient) had to walk me thru the set up and it was quite lengthy. She informed me that if I gave her authorization to take control of my PC there is a fee. After having just spent 140 bucks for this unit. I declined. Of the 4 or 5 Linksys Router's I've purchased. This is the first one I wasn't able to set up on my own. Other than that this is a great product. Rated 3 out of 5 by Long Time Linksys user from Quick Death Based on an email ad, I purchased this router from Linksys.com. It was to replace a 6-year old Linksys E3000 router. The router setup was simple, the speed was good and the range it covered was very good. BUT, on the 3rd day of operation, it died! To find out what was going on with the constantly flashing power light, I spent over an hour on the phone with a tech person from Linksys. He was verifying the router was, indeed, defective. I was told the router would be replaced because it was well within 90 days of purchase. Fortunately my old router was available for use and I was able to get back online to get the replacement details taken care of. Linksys support was very good about making that process quick and relatively easy. With any luck the replacement will last a little longer than the original! Rated 1 out of 5 by hrbcraig from Trouble from the beginning and slow. I bought this a week ago and all i have heard from my family since installing it is a chorus of complaints.... the internet is down, what happened to the wifi. Why is it so slow? My own experience has been the same. First the router lost all of the input data in the wireless input section so all the wifi users were down. Next the internet was down, or so our devices thought, but the answer was to reboot the router. And today... I am home and oh my, after rebooting the rounter the day has been spent waiting and waiting for every site. What is going on? Rated 5 out of 5 by SidPLit from Great Product Prior to receiving the MAX-STREAM AC 1750 router I was using a Linksys WRT54G2 V1.5 router for my four computers and Kindle Fire. The new Max-Stream is considerably faster with a much greater range than the old WRT54G2. The setup was extremely simple and within a short time I was up and running. I have 1 desk top PC hard wired to the router and another desk top on WiFi which prior to the new router had to be hard wired into the old router. It is now on wifi and works great. I also have 2 laptops that are on wifi and one is a considerable distance from the router but doesn’t have any problems receiving the signal. 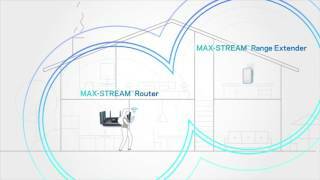 The Max-Stream is a great product that I would recommend to anyone in need of a router. Rated 2 out of 5 by Lizzie the Mommy from Fast internet, frustrating parental control Just bought this router and the internet connection is amazing and we love it, BUT found out that the only parental control for blocking websites is where you literally have to put them in yourself as blocked sites. When using my old router (which wasn't as nice) you could just go under and select to block all malicious and adult sites or just block malicious sides Etc which makes it easy when you have a little child and you don't know what websites they might accidentally click on so you don't know what to block or what will be a malicious site. Adding the old parental feature would bring the rating up to 5 stars. Rated 1 out of 5 by dkrm from Not what they say I purchased this as an upgrade because I have several computer that I work with in my home. I am a Forensic Photographer. It failed to lock onto two of my computers that are less than 20 feet from the unit. It takes forever. I am stuck with it until I can not take it any more and then I will change back to an older and somewhat slower unit until I can find something more satisfactory. I believe time is $ and I hate waiting for the unit to respond. *As reported by Ixia ixChariot v7.10 SP3. Test conducted by Tolly comparing EA7300/AC1750 router to 4 similar top selling and market leading single Multi-MIMO AC1750 competitor routers. 4.4X claim is based on the greatest difference in throughput to an individual client in a long distance trial achieved in such testing. The Linksys EA7300 AC1750 MU-MIMO Gigabit Router provides: (1) Up to 3.5X greater aggregate throughput in line-of-sight tests (2) Up to 3.5X greater per client average throughput in line-of-sight tests (3) up to 4.4X greater individual client average throughput in long distance tests Notes: Linksys running MU-MIMO Router. All testing using 5GHz band. Average of three runs. Source: Tolly, these claims are as of October 2016. Testing done in the United States with a MU-MIMO router produced for use in the United States. Review the full Tolly Report PDF for more detailed information. **Seamless Roaming is designed for devices that support the 802.11k standard including but not limited to iPhone (4s and later), iPad Pro, iPad Air and later, iPad mini and later, iPad (3rd generation and later), iPod touch (5th generation and later), Samsung S4 (Android 4.2.2/4.4.2), Samsung S5 (Android 4.4.2), and Samsung S6 (Android 5.0.2). For more information on supported Windows and other devices, please check with your device manufacturer. Seamless Roaming may require the latest Max-Stream firmware. Please check the support page of your Max-Stream router for more details.